Torture and related wrongdoing is longstanding CIA policy – ongoing throughout most of the agency’s existence, begun long before Gina Haspel’s involvement, continuing today no matter who heads Langley. Earlier CIA mind control experiments were conducted, McGill University’s Ewen Cameron was involved. Using his psychiatric patients, he kept them asleep in isolation for weeks, administering electroshocks and psychedelic LSD and PCP angel dust cocktails – using them as unwitting guinea pigs, violating core medical ethics and the rule of law. CIA human experiments began in the early 1950s, including sensory-deprivation experiments – developing unlawful interrogation methods amounting to torture. In his book titled “A Question of Torture: CIA Interrogation from the Cold War to the War on Terror,” Alfred McCoy discussed a half-century of Langley effort to develop torture techniques – no matter how heinous, immoral or illegal. He also showed that torture-gotten information is worthless. Victims say anything interrogators want to stop the pain. Yet torture remains official US policy, the CIA its chief practitioner, operating from secret global black sites. What began decades earlier continues – out of sight and mind, despite banned by international, constitutional and US statute laws. Gina Haspel is a career intelligence officer, the first woman nominated to head the CIA. Her gender fools no one familiar with her involvement in running a Thailand agency black site notorious for using torture during interrogations. Post-9/11, she was instrumental in launching global black site torture prisons. Reportedly she was involved in destroying incriminating videotapes, showing torture at the facility she ran along with others. Like all CIA operatives involved in torture, including top agency officials, she remains unaccountable for high crimes, rewarded instead of being prosecuted. During her Senate confirmation hearing, she repeatedly lied by evasion and deception. She lied saying she has a strong “moral compass.” Morality, ethics and respect for rule of law principles are incompatible with longstanding CIA practices. Her answers to questions were scripted, ducking ones on the illegality and immorality of torture, saying she believes in the agency’s work. Ahead of her confirmation hearing, Langley selectively declassified parts of her record, an attempt to portray her positively. A document obtained by an ACLU lawsuit showed her direct involvement in torturing Abu Zubaydah and Abd Al-Rahim Al-Nashiri. Trump supports use of torture, falsely believing it works, unconcerned about its illegality. 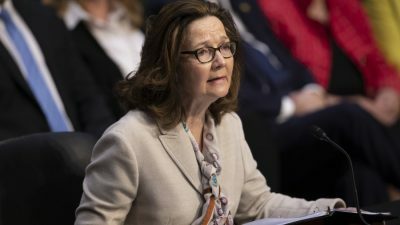 During Wednesday Senate testimony, Haspel raised more questions than she answered. Confirming her as CIA director will show Senate support for what free societies abhor – what’s longstanding Langley practice, sure to continue on her watch. She lied to her “superiors, Congress, and two presidents.” She’s an unindicted criminal rewarded for her crimes – heading for likely confirmation to continue them as CIA director. McGovern attended her Senate hearing – forcefully removed for demanding she answer questions about her involvement in agency black site torture. CIA whistleblower John Kiriakou said she was personally involved in torture because she “enjoyed it” – nicknamed “Bloody Gina” by CIA colleagues, he explained. Torturers have no credibility. Involvement in the practice throughout nearly its entire existence shows the CIA will continue what it spent decades developing under Haspel and future directors. She appears headed for confirmation. At least two undemocratic Dem senators indicated support – likely others along with most or all Republicans.